what a great layout- love this collection and how you layered it!! i don't think i will handle middle school so well. I already cried at 1st grade lol!! and preschool 2 LOL!! this year! The perfect page to document this milestone. I LOVE that newspaper background. It gives the page a newsy feel. The pops of red look great and of course the usual fabulous layering is all there! Such a sweet pic of A too. I really love how you have been using the black and white photos lately. And those colors on the newspaper print background are great! Love love love love this!!! I loveeeeeeeeeeeee the red and yellow against the news print background!!!! BEAUTIFUL!!!! 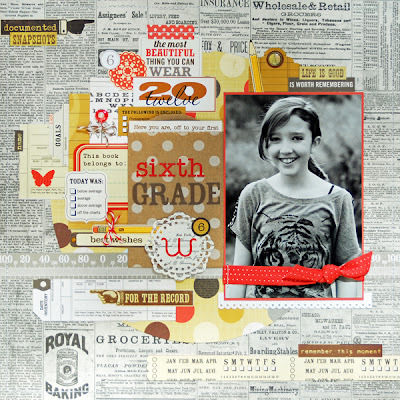 Love all the layers against the newsprint background! Beautiful photo too! Awesome page. Love how the colors pop off and the base page doesn't loook that busy. Sounds like she's doing great mom!!! Great page. I love that print background and the pops of colour. Love this layout and your daughter looking so earnest and full of promise! This is such a wonderful age. I remember grade 6 so clearly and it seems like such a short time ago that my daughters were in grade 6. (They are 36 and 38 now!!! Grade 6 is such an exciting year. i could see the metomorphis (sp) so clearly of my child becoming an adult. They started to make decisions on their own...some of them just amazed me. They were taken with stories of others kindness and tried to build on that pwithin themselves. I remember my youngest daughter went on a weekend retreat and found out that one 71 year old nun made all the guest beds every morning. It was something like 50 or 60 beds. After that, my daughter got up every Saturday morning and went and helped make beds for a year. Sometimes she brought a friend to help too! You are going to have such a fun year with your daughter. Fantastic use of papers! LOVING the background! Hard to believe they grow up so fast, isn't it? I hope middle school is going well. Love how the colors just pop off the page! This is absolutely gorgeous, Lisa! LOVE the newspaper background that lets the colors just pop! Wonderful page!!! Wonderful layers!! Such a fun design!!! You are the queen of layering and patterns. I love this!